One of the selling points of Comfort Inn Middletown is our proximity to the neighboring Outback Steakhouse. With the restaurant renovation nearly complete, I snuck over there (well, not really) with Spiro today to have a look-see. In speaking with someone working the floor, this the first Outback in the region to be updated with this most recent package and the staff and management are very pleased with the changes. I only had my iPhone with me so the quality of the pictures are of the iPhone 3Gs variety. It’s a sneak peek nonetheless. To be honest, you don’t have to sneak over there to see it, they are open for business and have been throughout the duration of the facelift. 1. Outback themed sign outside the restaurant placed at the entrance closest to the hotel. 2. The “17 Signature Spices” used to season the steaks on display near the front entrance hostess area. 3. Some booths were removed from the dining area to make room for more tables and a more open seating space. 4. The bar area has been updated with new decor, lighting and back bar. Warm wood tones and festive pictures surround the section. There is also a new waiting area with a flat screen TV and leather seating by the door. 6. New booths separated from the bar area. Is a nearby restaurant important to you when making your overnight plans? Comfort Inn Middletown and Outback Steakhouse are a great combo. A comfortable hotel with friendly people and a highly popular restaurant are hard to beat when looking to meet lodging needs. We look forward to welcoming you. Easter is coming! It’s so hard to believe it’s this weekend. Even though it’s late this year, it seems to have crept up on me. The good news is that it also means there’s about 5 weeks until Memorial Day which is the unofficial start of summer here at the Jersey Shore. Easter weekend is usually a pretty slow for us so we’ve decided to offer a special rate to everyone who is connected with us on social media one way or another to come check us out. Book your accommodations by calling 732-671-3400 request the Easter Special for a stay between April 22 and April 25th, 2011. The rate is $89.00* regardless of room type. Comfort Inn Middletown-Red Bank offers rooms with one queen bed, two queen beds and one king bed. All rooms have a hotel sized microwave and refrigerator. The entire hotel has free wireless internet. Our deluxe continental breakfast is available and free from 6:00am to 9:30am daily. Downtown Red Bank is 2.5 miles south on Route 35. April 23rd meet at Lot B on Sandy Hook at 8:45am for the Sandy Hook Birding Program. Search for hawks and songbirds with Scott Barnes. Bring a lunch, binoculars and weather appropriate clothing. April 23 & 24 See a demonstration of an old-fashioned sheep shearer at Longstreet Farm in Holmdel for Sheep Shearing and Wool Days. April 23rd Easter Egg Hunt in Ocean Grove at the Main Avenue Beach. April 24th will be the Easter Parade in Asbury Park. We have an added secret bonus too! Check in on Foursquare and if it’s your first time checking in with us (and even if it isn’t…) you’ll receive a voucher for a FREE Bloomin’ Onion at Outback Steakhouse. It’s located 10 feet from the hotel. Outback Steakhouse is finishing up their restaurant renovation and I’m hoping to make it over there to see it this afternoon. I’ll bring the camera and share so be sure to check back!! Happy Easter, we hope to welcome you to the Inn! *Applicable taxes are not included in that rate. Check Inn and Check In: Foursquare Special at Comfort Inn Middletown-Red Bank! Are you using Foursquare? Enjoy checking in? When you check in and stay with us at Comfort Inn Middletown-Red Bank, make sure you “check-in” on Foursquare to receive a coupon for a complimentary Bloomin’ Onion at the Outback Steakhouse. Click on the picture to visit our page. How do you feel about Foursquare? Love it? Hate it? I felt pretty “whatever” about it until I was shown a new way to look at it. I wrote about it last week which you can read here. 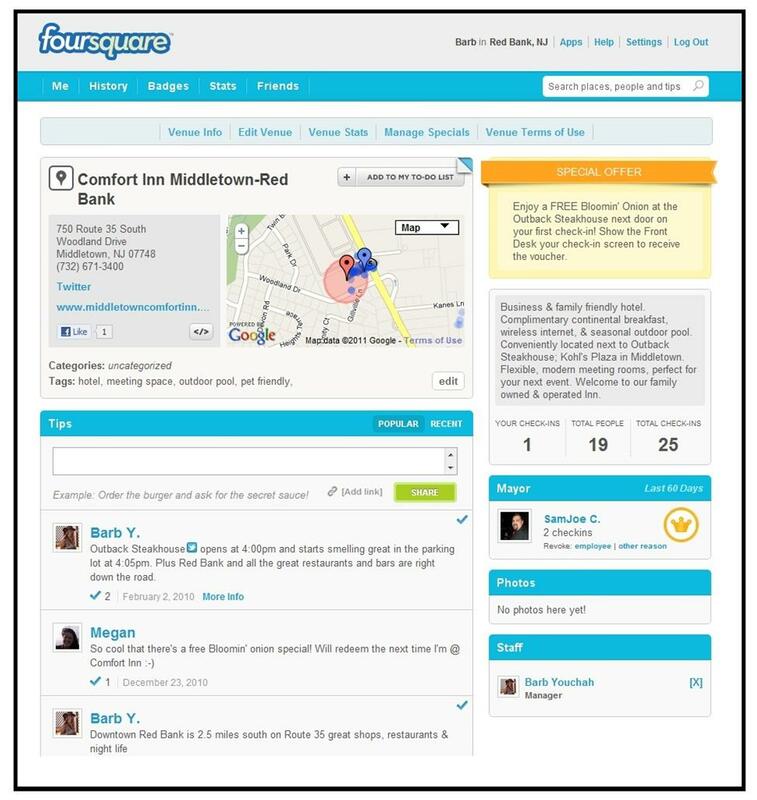 Think of Foursquare as a way to chronicle your experiences, kind of like a cool on-line diary. I’ve had my Comfort Inn Middletown Twitter search column set up in TweetDeck forever. It’s usually pretty quiet or is just me. (Boooring). Today I leaped for joy when someone checked in on Foursquare and I could welcome him to the hotel. Hey, its’ the small things sometimes that make the world go around. He didn’t write me back, which is fine. I know he got my Tweet because he started following us. I think that’s a much bigger compliment. What kind of special would you like to see when you check in at a hotel? Food, beverage, upgraded toiletries? Obviously my imagination is limited right now. Let me know what you think in the comments below. At a loss as to what to and see in and around the Middletown-Red Bank area this Valentine’s Day Weekend? Allow me to first remind you that Comfort Inn Middletown and Outback Steakhouse both have great specials going on starting on Friday. Here are some other fun things to do and see while you’re here. Anthony Bourdain, the internationally acclaimed chef, author, and host of Travel Channel’s “No Reservations,” has been dubbed “the bad boy of cuisine” for his rock star looks and blunt observations about the world of restaurants, chefs, and cooking. Join the Italian-American tenor who can sing it all, from the heroic volleys of Puccini’s “Nessun dorma,” to the tender phrases of “O Sole Mio,” for his full orchestra tribute to love! Blessed with movie-star looks, charm, and a classic Italian tenor voice, The New York Times declared that this, “Swashbuckling Italian tenor exhibits both the voice and charisma of a crossover star”. Pile on the winter gear and head out to Sandy Hook and join Linda Mack and the Monmouth County Audubon Society on a winter birding tour. Meet Saturday, February 12th at 10:00am in the Visitor’s Center Parking Lot. Don’t forget your binoculars. Not into being outside in the cold? There’s a Valentine’s Day Bake Sale and Cookie Decorating at the Sandy Hook Child Care Center on Saturday, February 12, 10 :00am to 12 noon. Pre-register for cookie decoration by calling SHCCC Director Jessica Long at 732-291-2368. Thomas and Friends LIVE are coming to the The MAC at Monmouth University for two shows at 3:00pm and 6:00pm. The show will be Thomas saves the Day. For more Information visit The Mac at Monmouth University Event Schedule for more information. On Saturday evening February 12th Count Basie will have A Valentine’s Doo Wop featuring Jimmy Beaumont & the Skyliners, Frankie Lymon’s Legendary Teenagers, The Heartbeats, Cleveland Still & the Dubs, and Special Guest Star Johnny Tillotson. No matter what you decide to do this weekend, I hope you enjoy. Whoa! Where did the time go? It’s already Groundhog Day and that means Valentines Day is only 12 days away. The very fact that Valentine’s Day falls on a Monday this year gives us a great reason to offer a great special for an extended period! Book any room type at the Comfort Inn Middletown for just $89.99 while room types last. The special will run from Friday, February 11 through Sunday, February 20, 2011 (my birthday woo hoo!). Call the hotel directly at 732.671.3400 and mention the Valentine’s Day Special to take advantage of this deal. That is way more food than I would be able to consume but it sounds fabulous and for $37.99 plus tax and gratuity per couple, you really can’t go wrong. Contact the Outback directly for pricing at 732.796.0110. Happy Valentine’s Day to you, we hope to see you over our way. The Crack the Code 5K Race is coming up quickly. The weather has not cooperated for training purposes and I’m hoping that I can at least finish in less than 30 minutes. It’s not a great goal, but a goal nonetheless. In a previous post we detailed the race. For complete race information and they have a great website set up at http://www.crackthecode5k.com. If you have more specific questions, you can reach Janet Clapp, Race Director at crackthecode.nj@gmail.com. The race takes place Saturday, April 10, 2010 at Vonage Headquarters in Holmdel, NJ. Registration begins at 8:00am, the 1 Mile Walk begins at 9:30am, the 5K begins at 10:00am and the Children’s Races are at 11:00am. If anyone is traveling in from out-of-town to participate in the race the Comfort Inn Middletown has a discount available through our front desk call us at 732.671.3400. Crack the Code in conjunction with our friends over at the Outback Steakhouse are planning a fundraising luncheon for Saturday, April 24, 2010. All of the profits will go to Crack the Code. It will be held from 12:00pm to 2:00pm at the Outback Steakhouse located at 740 Route 35 South, Middletown, NJ 07748. Tickets prices are $25 for adults and $15 for kids under 12. The menu will consist of Sliced Sirloin, Chicken on the Barbie, and Alfredo Pasta with Broccoli. Soda, Coffee and Tea re also included as well as freshly made cheesecake. There will be a gift basket auction and you can get all the details at the Crack the Code Website.